Are you looking for the perfect accommodation for your holiday in Sardinia? We have already selected our favourite destinations to make sure you'll enjoy a unique holiday in Sardinia. To travellers wanting to explore more than one destination in Sardinia we recommend taking a look at our round trips or creating your own. We love to help you discover the most beautiful spots in Sardinia and we're happy to tailor the trip to your specific preferences. 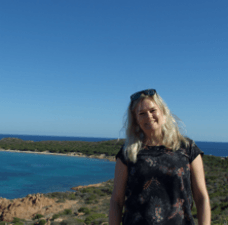 Before she decided to move Sardinia to build her life with her Sardinian partner in 1998, Marieke Geurts had already often visited the island. 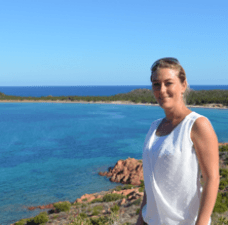 Marieke envisioned an improved customer service for travellers looking for a Sardinian holiday and wanted to turn her passion for the island into a job. After a tourist education and over 10 years of experience in the Sardinian travel industry, she decided to start her own business in 2009 by founding Sardinia4all.com. Marieke runs Sardinia4all from the southern part of Sardinia, perfect for maintaining our network with the accommodations’ hosts and exploring the island in order to discover even more unique locations and sights there. In April 2009 a companion was found in Sanne Segaar. Sanne has also completed a tourist education and has been working in the industry for many years. She has loved spending her holidays on this particular island in the Mediterranean sea since 1993. Sanne runs the head office in Leiden, the Netherlands, from where she keeps in close contact with the clients and travellers. She stays up-to-date by regularly visiting new locations and accommodations in Sardinia. She now has an excellent knowledge of the island. She loves to advise you on finding a suitable accommodation or planning a tailor-made round trip across the island. On the first of March 2017 Bianca Aardenburg started working at Sardinia4all. Having completed a tourist education she has been working in the travel industry for years. She’s frequently travelled to Italy and Sardinia. Apart from Dutch and English Bianca speaks German fluently and she’s currently enrolled in both French and Spanish language classes as well. Travelling is one of Bianca’s biggest passions and she adores Italy, mainly because of its culture, its hospitality and its cuisine. After a holiday in Sardinia with her family she fell in love with “l’isolla bella”! Bianca says: “Sardinia is such a beautiful and versatile island. I love the hidden bays with crystal clear waters alternated with the island’s rugged nature. The Sardinians are such a friendly and hospitable people. It’s like time has stood still in some of the villages, I love that authenticity. Sardinia is pure and it has a fascinating culture. It’s so much more than a beautiful destination for a beach holiday! Cycling, hiking, horse riding, snorkelling, diving… There’s just so much to do! My recommendation? A 4-day trek with donkeys! Our newest team member Lena Lambers started working at Sardinia4all on 1 November 2017. Originally a classical archaeologist working in the preservation of historical monuments, Lena's studies of the Roman and Italian culture and many travels have resulted in a long-lasting love for Italy. She can therefore not only plan an unforgettable holiday, she can also give many tips for exciting excursions. Lena is a native German, speaks English fluently and Dutch well and she even is proficient in Spanish and Turkish. 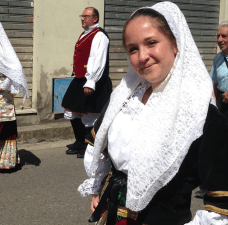 Lena says: "The cultural history of Sardinia is extremely fascinating. Because of its strategic location, in antiquity Sardinia was a popular trade post and therefore a hotly contested area. When travelling across the island there are traces of its exciting past everywhere. Sardinia has been inhabited by numerous cultures since the Neolithic period, most visible of which were the Nuraghe who built more than 3,000 tower-like nuraghi which you can still visit nowadays, but there are also even older sites with dolmens, giant tombs and menhirs. In the last millennium BC Sardinia was a centre of Phoenician-Punic commerce and in the Punic Wars it was the focus of attention of the Romans, who also left many architectural traces which can still be seen today. An incredibly exciting history!" All accommodations on our website can be booked 24 hours a day, 7 days a week. However, if you have any questions you can call or mail us or use our chat for an extra quick response. You can contact us during our opening hours (Mon - Fri 09:00 am to 05:00 pm).